Disney’s 2011 theatrical release TRON: Legacy is headed for Blu-ray Disc, DVD, and digital download on April 5, 2011. The release will also include the original 1982 film Tron, packaged as TRON: The Original Classic Special Edition. 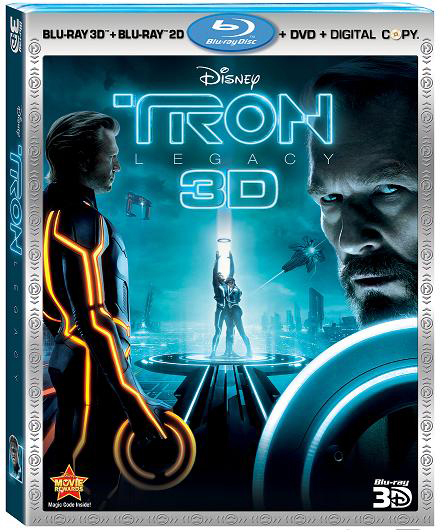 TRON: Legacy will be formatted in both Blu-ray and Blu-ray 3D with 1080p video resolution and 7.1 channel surround sound. The releases will showcase some new technology. Disney Second Screen is a new feature which will allow cross device synched viewing of the story behind the film. Meaning, you can switch from an iPad to a laptop seamlessly without missing any content. Tron: Legacy (Five-Disc Combo Blu-ray 3D/Blu-ray/DVD/Digital Copy + Tron: The Original Classic Special Edition on Blu-ray – Pre-Order from Amazon.